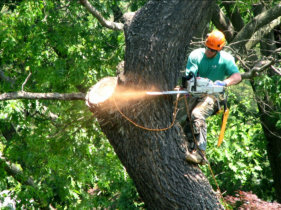 AJ Tree Service is well-known for being a locally-operated and fully-insured Tree Removal Service expert. We offer you solutions if you’re tired of looking at a yard full of pesky dead trees or unstable branches that are in danger of falling and hurting people. Knowing that Oklahoma is part of the Tornado Alley, you want to make sure your property is properly cleared of trees that may threaten to damage your property before the next natural disaster strikes. Besides making sure your property is safe from tree-related accidents, you can also increase the space in your front or backyard by clearing away the unwanted growth. Our crew of tree specialists have years of experience in tree removal, stump removal, and basically all types of land clearing operations. We do our job quickly, safely, and professionally when we carry out Tree Removal and Landscaping in Broken Arrow, Oklahoma.